Oops! 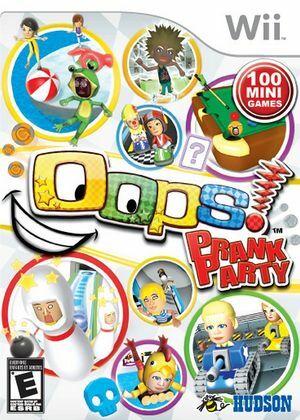 Prank Party (aka Games Island in Europe, Party Game Box 100 in Japan) is an all new way to party on Wii. The game features 100 brain-teasing, puzzle-solving, reflex-testing games. Putting a new spin on hilarity, Oops! Prank Party offers embarrassing costumes and pranks on the player that loses any given game. On screen actions have lasting effects on the character avatars that stay with them throughout the entire game. From throwing on a monkey costume to wearing cardboard pants; anything goes in this irreverent part of the game that will have players laughing out loud! Oops! Prank Party will have players coming back for more off-the-wall 4-player action time and time again! The graph below charts the compatibility with Oops! Prank Party since Dolphin's 2.0 release, listing revisions only where a compatibility change occurred.